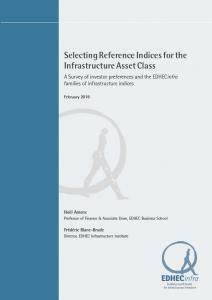 Selecting Reference Indices for the Infrastructure Asset Class: A survey of Investor preferences and the EDHECinfra families of infrastructure indices. This position paper examines the results of a large survey of infrastructure investors and their preferences for the segmentation of the infrastructure asset class. Using those results, coupled with modern finance theory about what should matter to investors, this paper sets out a taxonomy of unlisted infrastructure investment indices and benchmarks that can give structure the global unlisted infrastructure asset class.